In Windows Defender under device performance and health, a yellow warning triangle appears and says device driver, 1 recommendation. I have no idea how to install a device driver! My Windows Defender is always on, it was “core isolation” under device security that was “off”. Question: How to install device driver? I tried to send a screen shot of the Windows Defender section on Device performance relating to my CPU. It doesn’t seem to want to submit with my entry so I’m explaining that on that screen it’s showing Device driver recommended, with a yellow triangle. It shows storage capacity, no problems and apps and software, no problems. 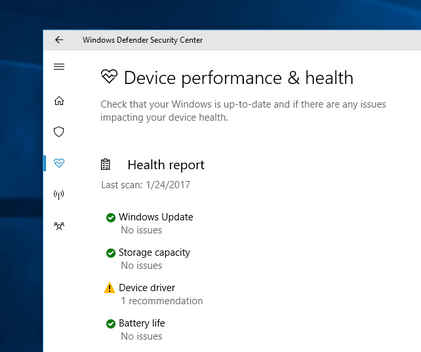 This is withing the Windows Defender menu under Device performance and health. Which device driver are you talking about? Could you please explain it more so that we can give you exact answer. I tried to send a screen shot I took of the Windows Defender page showing the Device performance and health of my CPU. It shows the health report with storage capacity, no issues, apps and software, no issues but Device driver recommended on the same page. I preferred to senf the screen shot but it won’t go so I’m explaining the problem…in Windows Defender app. If the screenshot doesn’t attach here then you can send that screenshot directly through email at info@techsupportall.com. Please check the screenshot below, is it seems like this? If it looks like this, does it give any more detail when you click on device driver? or have any button to next or update this? Yes, it looks like that and clicking on device driver did not work. It should gave you more detail which device drivers are not installed properly. Windows defender is not responding properly, is an another issue for you to fix the “device driver” problem. To fix this “device driver” issue manually, go to “device manager” and then install / re-install that device which shows not installed properly.